To travel the 257 miles from State College, PA to Memorial Sloan Kettering Cancer Center (known to New Yorkers as Memorial) less than two blocks from the East River in New York City, I have to get out of bed. What follows is a photographic recreation of my getting out of bed on June first, for my most recent expedition to Memorial where I went for tests and more tests and the surprising news that Dr. Paul Russo had decided an operation would be a good idea. Here I am in bed. I cannot stand without holding on to something. That does not mean I cannot dance, if I am careful and have a partner who understands, I CAN dance. I cannot walk, but there are a wide variety of devices that can help me get from here to there. Plus, my feet work well enough that I can drive a car. 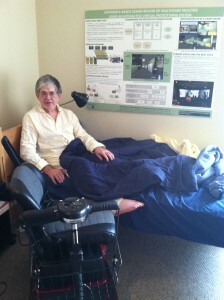 To get out of bed, I need to transfer to a mobility device. 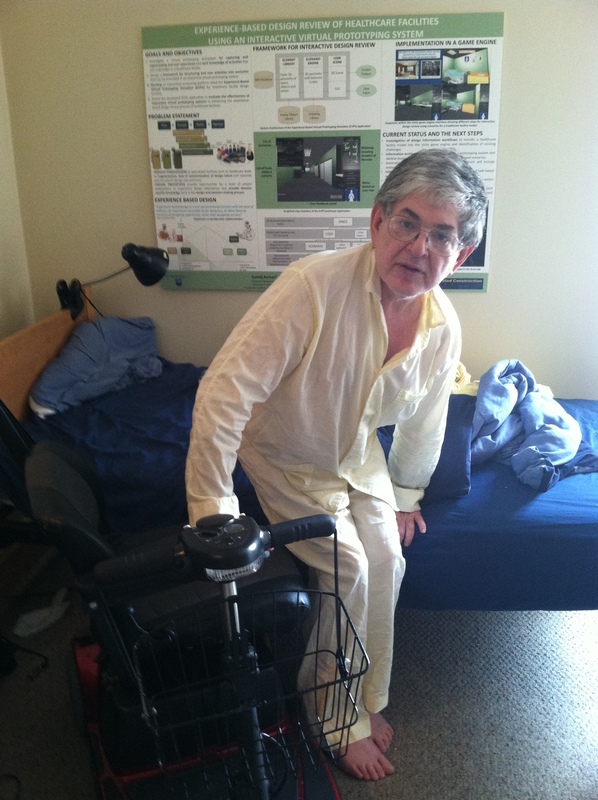 The following photograph shows me transferring from the bed to a scooter. First invented in 1968 by my friend Al Thieme, CEO of Amigo Mobility, the device is formally called a Power Operated Vehicle (POV) scooter. 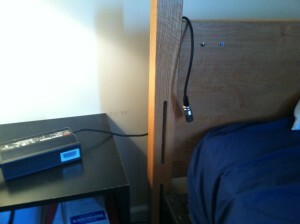 It is essential to keep the battery charger in mind at all times and to make sure it is positioned in the right place. Before going to sleep, have a plugged in battery charger with a fan inside sitting on the bed table preparing for the period after sleep. Hearing the hum of the fan reassures that the charger plugged in next to my bed will provide me in the morning 25 miles worth of power–25 miles (to repeat) for one full charge. 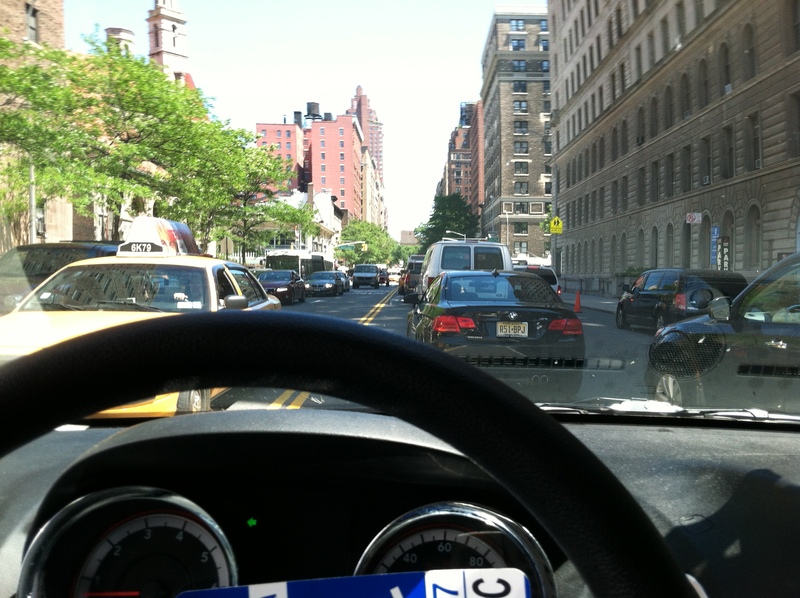 Finally, after considerable effort and stops for this and that (including, of course, getting lost), here is a photograph I took of myself driving a mini-van through the streets of New York City in June—the scooter having been taken apart and put in the rear. As one born and college educated in New York, I like the thrill of driving in insane cross-town traffic where there are no rules of the road except aggression. This is what it is like to be en route to appointments to test my kidney and heart and to learn of the operation I had not anticipated. Joel Solkof was at a complete stop in the MIDDLE of a crosswalk (where sang froid pedestrians pushing baby strollers had to climb over cars) when he took this photograph. Today is Monday, July 8th. I am in State College planning the logistics of getting to New York for the operation in August at a hospital in New York City where the word MEMORIAL is chiseled ghoulishly in large stone letters above the entrance. Fashion note: The beautiful 100% cotton yellow pajamas I am wearing in bed are part of a generous sartorial gift from the family of the late David Forer, a man of impeccable taste. Copyright © 2013 by Joel Solkoff. All rights reserved. In 30 days (the actual date is Thursday, August 8th), I am scheduled for major surgery at Memorial Sloan Kettering Cancer Center (MSKCC). The surgery will be performed by an expert in the field of kidney surgery which my physician here in State College (250 miles from New York City) advises me cannot be reliably perfumed in the greater region where I live. My State College urologist referred me to Sloan Kettering in New York where Dr. Paul Russo will perform the surgery. The surgery, if successful. and it is highly likely to be, will remove the large tumor that surrounds my right kidney. The surgery will also remove one-third of my right kidney–in effect saving the kidney. Since imaging indicates the cancer has not spread, the operation is likely to eliminate the threat of my dying of kidney disease. Period. That is a big load off my mind. I hope you are able to donate money to help defray the travel expenses to surgery and during the two-week estimated recovery period.and of course the journey back home. My estimate is that $3,000 would be amount required and when I achieve that amount I will tell you and take down the donation button. Begging for money is difficult enough. Begging for money after I have raised the requested amount is tasteless.